Of all the things I've lost, I might miss American restrooms the most. The notion of free, public restrooms does not exist in Russia. If you want to use the bathroom, you have to pay for it (usually a little under $.50) After you give your money to the toll booth lady outside the bathroom, she gives you a piece of toilet paper. 2 squares, maybe 3 if you're lucky. One of the reasons I hoard napkins, tissue and toilet paper like a kleptomaniac. 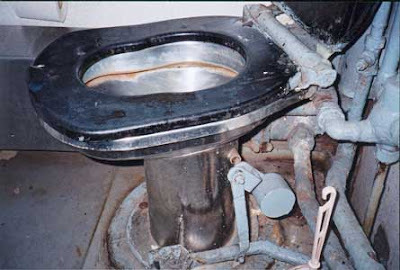 Many toilets do not have seats OR they HAD seats which have been removed, for reasons I cannot fathom. I also cannot understand why I have to pay the toilet lady if the toilets are still covered in pee. What duties is the toilet lady responsible for, exactly? They do not include cleaning the restrooms or supplying soap for the sink. Even in theaters and "nicer" public places, many toilets actually have no vertical components at all. Rather, there's a hole in the floor with space to carefully place your feet on either side. I'm sure this is all doing wonders for my legs. Here you can see a picture of the toilet on the train, and a standard hole-in-the-floor toilet. LOL - Ooooooh I laugh because when I was in Romania... the holes-in-the-floor were so common... and I never did figure them out. I just held it until I got back to the place we were staying. At least I knew no pee was on the seat. EEK! I forgot to explain the seatless toilets to you. I AM NOT MAKING THIS UP. It's actually very simple. In order to emulate the hole-in-the-floor configuration, women will stand on the toilet seats (apparently, this is considered to be more sanitary), eventually breaking them, and causing them to be removed. I have been in restrooms which had signs reading, "Women, please do not stand on the toilets." I have seen dirty shoe-marks on the seat.